What Day Of The Week Is May 22? 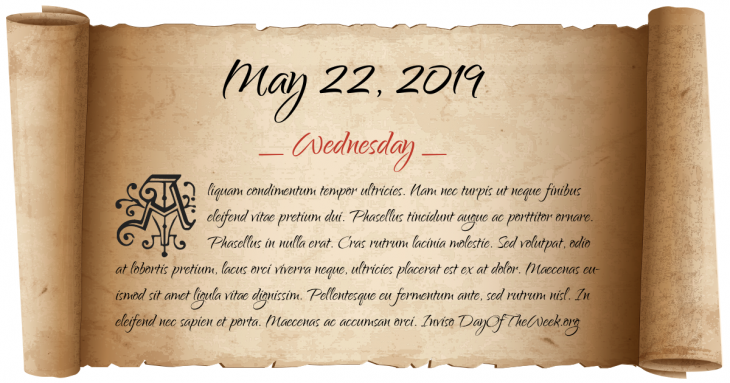 May 22, 2019 is the 142nd day of the year 2019 in the Gregorian calendar. There are 223 days remaining until the end of the year. The day of the week is Wednesday. Serbian King Stephen Uroš I and the Republic of Venice sign a peace treaty. Reconstruction: U.S. President Ulysses S. Grant signs the Amnesty Act of 1872 into law restoring full civil rights to all but about 500 Confederate sympathizers. Cold War: in an effort to fight the spread of Communism, U.S. President Harry S. Truman signs an act into law that will later be called the Truman Doctrine. The act grants $400 million in military and economic aid to Turkey and Greece, each battling an internal Communist movement. Who were born on May 22?